← Trump Not Running For President: So When Does The Circus Leave Town? Newt Gingrich: Breakfast, Lunch and Dinner At Tiffany’s To The Tune Of $500,000? Now I get it. A “real” fiscal conservative like Newt Gingrich considers himself suitable to run the country’s budget, finances and economy yet the sky is the limit on his personal Tiffany& Co. jewelry store debt. I figure you would have to eat breakfast, lunch and dinner at Tiffany’s to accumulate the time it would take to spend $500,000 in a couple of years. I know Tiffany’s is pricey and it would depend entirely on purchases but Gingrich and his third wife Callista sure don’t practice fiscal conservatism in their “real” life. Don’t they know they can pick up perfectly good fake Tiffany jewelry on any New York City corner or Mexican resort town? The ex-Congressman and Speaker of the House who has thrown his hat into the Republican Presidential nominee ring on various changing platforms like family values (he has been married three times and divorced a wife who had cancer) and of course fiscal conservatism. The Tiffany story broke yesterday by Politico’s Jake Sherman. It immediately made the rounds of all the usual places but Gingrich and his camp have been busy “no commenting” on his revolving charge at Tiffany’s with an extraordinarily high debt ceiling. Interest rate? Unknown. 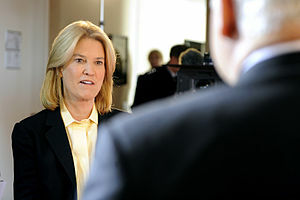 Shockingly, Greta Van Susteren somehow mustered up the nerve (Gingrich was until recently a Fox contributor) to ask him on her show last night about the Tiffany & Co. bill. She of course, backed down immediately when he said “I’m not commenting on stuff like that.” Fox has long had this love-affair with Gingrich and his political analyst skills (quite the joke to me). So, I’m wondering if Gingrich the professed candidate does not want to comment on “stuff like that,” what exactly is he willing to comment on that just might be of interest to potential voters? Are we really supposed to believe that he is in touch with the masses? Or that he can be fiscally conservative with our money in Washington? Does he think for one minute that just because the wimps at Fox News back down from asking him questions that the rest of the media will too? This guy is so far out of touch with real people that I can’t even believe Republicans will end up standing for whatever it is he says he stands for. The reality is Gingrich stands for the elitist, business-as-usual, good-old-boy image that even the Republicans are trying to shake. I’m going to go out on a very short limb here and say that Newt Gingrich is toast. He’ll never win the Republican nomination and he will keep rubbing everyone (including his own party) the wrong way until the only show he will be wanted on is Fox. That’s how you know you are toast. Tagged as FOX news, Fox News Channel, Greta Van Susteren, New York City, Newt Gingrich, President, Republican, Tiffany & Co.